move, came an entirely different setup. But we’ve NEVER had an actual ClassROOM. but with a few tips and tricks it’s definitely doable! I simply cannot do that to our Living Room. amount of time to get through the day. but it works for us! I also thought I’d include a few TIPS to share with you. out your own school space. Nothing magical….take em’ or leave em’. I put One big kid on each side. Baby is on my lap, in a walker, or just maybe even napping! Current workbooks and projects are stored in this amazing “Apprentice” desk organizer. I first saw this over on Educating Layton and Delightful Learning and I rushed right out to buy one. (Note: Staples as since discontinued this product). It was well worth the money. This thing holds everything Sissy and Bubba are doing for the day, as well as basic supplies and tools. It Spins, and has handles on the sides so you can pick it up and throw it in your closet when you’re having people over. TIP: Spend a few moments during the first week of school teaching children where to put their new things back. Do NOT clean up for them…..teach a man to fish is a much better concept. Break time doesn’t start, Lunch isn’t served, and the school day isn’t over until every last paper and pen is put in it’s PROPER place. Eventually it becomes second nature. This is the closet that I recently cleaned out, remember the before pictures? Yup, still clean….Yea me!! And Yea children!! The bottom levels are dedicated to Monkey (2) who has lots of themed “Big Boy Boxes” I suppose these are like Workbokes, except they have LIDS. Do workboxes have LIDS? I dunno. But these are not really workboxes. They are FUN boxes! These are boxes he can pull out (one at a time of course) and work on while the kids are busy with their school work. Monkey LOVES his Big Boy Boxes, and he is being taught to clean up before he “trades” for another. Yes. A Two-year old boy can be taught to clean up after himself. I didn’t believe it at first, but it’s true. TIP: One trick I only recently learned was to keep his wooden puzzle pieces all together in one box. Then I can easily just slide the boards into the side spaces and not have to worry about the pieces falling out or getting lost or causing mass confusing in the closet area. TIP: When organizing buy enough containers that you can all of the same color/size. They fit together better, the look nicer, it will give you peace. Got mine from Walmart, $1 each, big ones were $3. $30 makeover. And let me just say that I love having things organized this way. It makes it SO simple to grab the necessary tools as we need them. and it takes me all of two seconds to find just what I’m looking for. Where does she keep all her Teacher Supply books? 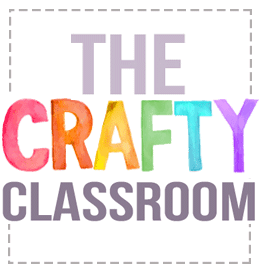 Isn’t this THE CRAFTY CLASSROOM….Where are all the craft supplies? 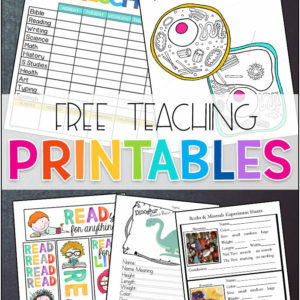 What about all the resources that will be used later in the year? Where do the children do their online activities? Where are all the children’s BIG projects, ones that don’t fit into anything. And for the Love of Peanut Butter what about blogging? Okay, that’s sort of a cop out eh? This is my desk. MINE. anywhere near this entire corner of the living room. 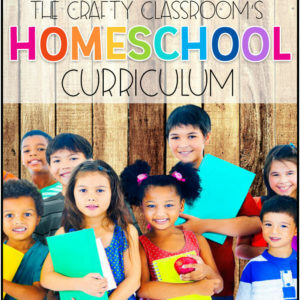 projects and resources for our homeschool. It’s also where I blog. and conjuring up all sorts of funny, inspirational things to tell you about. My children also have their own desk. To share. (that makes two desks in our living room are you keeping track here? This is a smaller desk where the kiddos can do all things on the computer. They’re happy, I’m happy, Happy computer using family. TIP: Having a second workstation can do wonders for quieting down your classroom and keeping people happy. that don’t exactly have a place yet. I repeat this is a “Catch all”, and NOT a Junk Drawer. Most of the current Teacher books that I have are piled on my desk or hidden in this handy little cupboard next the the kitchen table. TIP: When shopping for furniture, look for things that can double as hidden school storage! Next to the cupboard is our Kitchen hutch. When my kids do good work on a lesson, I display it on a shelf inside, which has plenty of room for all their craft projects. They LOVE having their projects displayed this way, like cherished keepsakes….and whenever Grandma comes she knows where to look to see what her little stinkers have been up too. I love that my fridge looks like a fridge. I cannot stand watching art projects slowly slide down the fridge door with each successive slam. Hmmm….Maybe I should delete that last paragraph before I publish. (TIP: Keep past projects in a rubbermaid, great to revisit for upcoming lessons…but only keep a few choice items. YOU Seriously don’t need to keep every little dried up corn kernel your kid glued to a empty yogurt container. 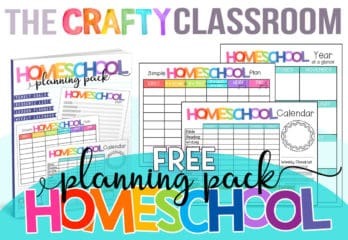 You’ve got to chuck some of that stuff….lest your neighbor submit your homeschool classroom to A&E’s Hoarders or something. And finally on to the Crafts. Craft Resources are strategically kept out of the house. 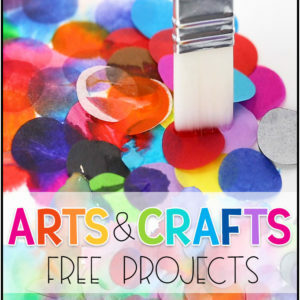 I’m so over trusting my children NOT to get into the finger paint, glitter, glue, colored sand, fill-in-the blank with any other craft material you don’t want logged in your carpet, toilet, pillowcase fill-in-the blank with anything that belongs to you and was expensive. This method ensures harmony and an overall feeling that Life is good. Okay so that is our entire classroom this year folks! or easy to ignore if you didn’t.